HomeAway Inc., a vacation listing site that’s been focused on homeowners, is launching a property management referral network and a pay-per-booking feature that will make it easier for property managers to use the platform. The Austin, Texas-based firm claims to be the world’s largest vacation rental marketplace. The company operates a stable of websites that includes HomeAway.com, VRBO.com and VacationRentals.com, which advertise more than 775,000 vacation rentals in 171 countries including the U.S., United Kingdom, Germany, France, Spain, Brazil and Australia. HomeAway is bringing property managers into the fold to lower the barrier to entry for homeowners who want to rent their properties but don’t want the hassle of managing them. HomeAway will connect them with vetted property managers who provide services in their area, Jon Gray, senior vice president of HomeAway, told Inman News. The firm — which launched in 2005 and went public in 2011 — has found that it takes a homeowner an average of eight hours per week to manage a vacation rental. The referral network was a way to bring professionals into the process and get more homes on the site, Gray said. Until now, HomeAway operated solely on an annual subscription model where homeowners or property managers paid an annual fee starting at $349 to list a home in the network with no booking fees. Now, HomeAway will connect homeowners to property managers in its network who will take over the marketing and booking-related work for the homeowner, plus on-site management if the homeowner wants it, without an upfront fee. Instead, the company will take a cut of the rent. 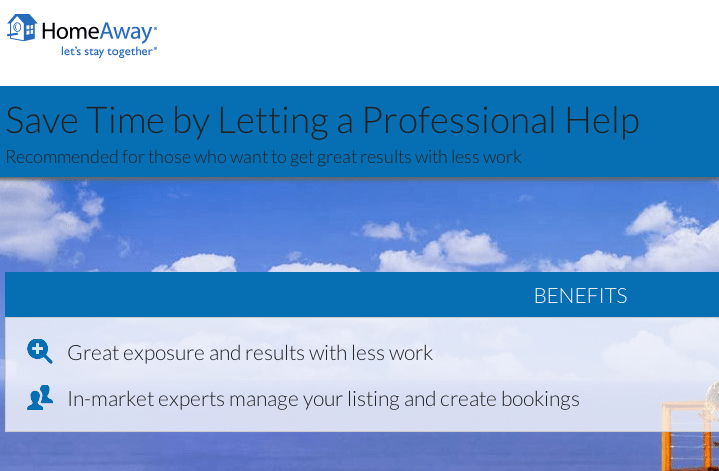 For the referral service, HomeAway charges the homeowner a percentage of the booking. The percentage varies according to the level of service the homeowner chooses, but averages approximately 20 percent of the rental price, HomeAway estimates. The cut includes a yearly subscription to list the home in HomeAway’s network. The referral network launches with more than 40 referral partners that HomeAway has worked with before, including Evolve Vacation Rental Network and Turnkey Vacation Rentals. To qualify for the network, managers must list a minimum percentage of their properties with the site and guarantee that all referred properties purchase annual subscriptions. Property managers interested in joining the network can reach out to HomeAway account managers to see how they may be able to fit in, Gray said. Homeowners who choose the property management option are presented with a list of firms in the HomeAway network that provide services in the home’s ZIP code. Homeowners then choose the property management firm they prefer. HomeAway users also now have the option to pay 10 percent of a rental charge and no upfront fee to list a property. HomeAway says this option is good for users who rent their properties for less than six weeks in a year. The pay-per-booking feature makes it easier for homeowners, and especially property managers with a bunch of homes to list, to get homes onto the site with no upfront fees, Gray said. HomeAway has 1,400 employees located in 18 different offices around the world and brought in $280.4 million in revenue in 2012, according to its second-quarter earnings report. FlipKey, a vacation rentals site from TripAdvisor, and “travel rentals” site Airbnb are also active in the vacation rentals space and work with rental property managers to some degree.